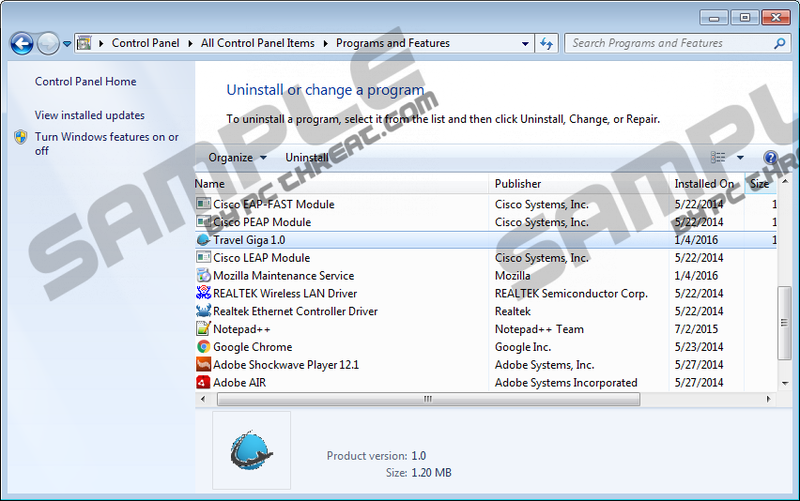 Many users consider ad-supported programs as harmless which is untrue, and we are going to prove it to you by analyzing Travel Giga, an adware-type program that you ought to remove as soon as the opportunity arises. Make no mistake; this application was developed specifically to promote certain websites, and it is in no way related to traveling as its name and website suggest. The fact of the matter is that it will promote various websites and some of them are of malicious nature and may compromise your computer’s security. You may have gotten this program unintentionally since its distribution methods are rather dishonest. So if that is the case, then please read this whole article to know the whole truth about it and uninstall it using our guide. If you have accidentally installed Travel Giga, then we want you to know what you are dealing with. Our thorough research has revealed that this application has nothing to do with traveling offers. The websites it promotes are unrelated and do not adhere to the theme of traveling. When you download this application from its dedicated website, it will redirect you to one of its promoted sites at http://interest4.valuedinformation.com/numbers/?t=5&c1=RDTVG&u=&im=. This site contains various survey links but do not redirect to their respective pages, so currently this website is not malicious. However, the bulk of the promoted websites will be presented using either Internet Explorer or Travel Giga’s Graphical User Interface window. The content presented by both of these platforms is identical and we have found the in this application can promote a total of six unique websites. http://download.safepcrepair.com/index.jhtml?partner=^AW7^xdm326&sub_id=316650_3631, for example, is set to sponsor a PUP called SafePCRepair Toolbar. It is a browser extension that we have classified as a potentially unwanted program because its purpose is to hijack your browser’s search engine and display advertisements in the search results of its featured search engine Search.ask.com. Some websites such as http://bestprizeland.nibi.info/?sov=62375101&hid=fxfpjphfjxxp&ref=dm&&noalert=1&redid=491&gsid=68&id=XNSX.201858::7340-r491-t68 are currently down so we do not know their contents. Nevertheless, we tend to think of it as an unreliable website unless proven as safe. One website in particular was classified as hazardous as it features a download of an unidentified malicious program. The thing is certain — you must not trust this program’s promoted content as it may get your computer infected with more malware. Now let us go over this program’s origins and distribution methods. Travel Giga is in many ways identical to CrunchTravel, StrataBeauty, and Flexible Family. They all come from the same group of developers, but the company that owns them is unknown. In any case, the methods used for disseminating these applications are in most cases the same, but in some cases, they do not come bundled with third-party software. Like many if its counterparts Travel Giga is disseminated using a dedicated website at Travelgiga.com. Now, this website would be unknown if it were not for marketing techniques employed by the owners. For the time being this adware is advertised with the help of other adware-type programs and browser hijackers and feature a link to Travelgiga.com. This website contains a unique installer. This installer is known as InstallCore and our research suggests that it may come bundled with potentially unwanted programs such as MyPcBackUp, adware such as Search Know, and various browser hijackers such as Sweet-page.com. The end result is that you get more than one malicious app so reestablishing your computer’s safety is of utmost importance. In conclusion, Travel Giga’s shady developers use dishonest marketing to present it as an app that presents travel-related offers. As you have learned, it does nothing of the sort and this program is used to preset random websites that may be malicious. Therefore, we invite you to make use of our removal instructions and get rid of this malicious adware-type program for good. In closing, we suggest scanning your PC with an antimalware program because there is no way of knowing what might already be present on it. Type Control Panel in the resulting dialog box and click OK.
Quick & tested solution for Travel Giga removal.